Note: Later re-released twice: first as a straight re-release on DVD in 2013 as part of The Legacy Collection, and then as a separate release on DVD/Blu-ray in 2017 with the unfilmed scenes animated. Note: Single tape release, packaged in a double tape box with an exclusive paperback book containing the script. SHADA. The long forgotten adventure destined to bring the Doctor face to face with the evil Skagra and his master plan for total omnipotence. Recording of this 6 part adventure in 1979 was sadly never completed until now — with the aid of Tom Baker, Doctor No. 4. 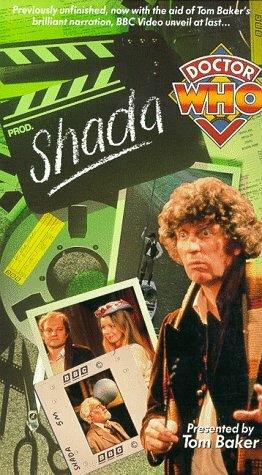 Now all available filmed and recorded sequences are linked by his brilliant narration allowing BBC Video to unveil Shada in its entirety at last. This unique pack contains a video and a copy of the original scripts — a great addition to the wealth of Doctor Who titles on BBC Video. Note: Does not include a script book. Same as UK edition (complete with mis-spelling of "Rassilon"), except that the last sentence (referring to the script book) has been removed, for obvious reasons. Note: Includes same script book as UK release.